My fingers have been busy juggling many things of late; here is a sampling. 1. 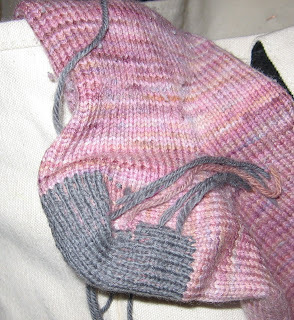 Darning socks is rather addictive, especially when listening to good audio books. Who knew? 2. 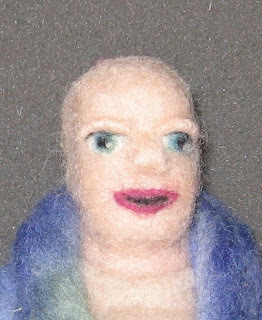 Needle felted figures sometimes look like Bart Simpson before you add the hair. 3. Seeing this little test pop up on everyone's blogs gave me flashbacks to tenth grade typing class, where my cute-but-slacker boyfriend sat behind me. He could barely type 3o words per minute, so after he screwed up his time tests he liked to reach forward with his foot and unplug my typewriter while I was still madly typing away. (I'm clearly dating myself here, since current tenth graders--and many of my readers--probably would not recognize an IBM Selectric, but there you go.) Typing has been one of my most marketable skills over the past years, allowing me to land some decent temp jobs while getting myself through graduate school.